Sebastien Loeb driving the Peugeot 208 T16 has blown away the previous overall Pikes Peak record by more than a minute-and-a-half. When they paved the Pikes Peak race course last year they knew records would begin to fall. But what Sebastien Loeb did today was nothing short of spectacular. Sebastien Loeb of France who is a Nine-time World Rally Champion set the racing world on its ear today by demolishing the overall track record in just 8:13.878. To put it in perspective, last years record run by Rhys Millen was run at 9:46.181. That’s an incredible minute-and-a-half faster than the previous race record set last year. Usually records are only separated by seconds which makes this record run by Loeb and his Peugeot even more spectacular. This was his first appearance in the "Race to the Clouds," and the French driver maneuvered through the 12.42-mile course obliterating last years record. He was driving a Peugeot 208 T16 in the Unlimited class. Taking one minute 33 seconds off the old record beats last years run by more than 15 percent. The record run today to the 14,115 foot summit had to be error free. And the Peugeot 208 T16 had to tuned perfectly for the altitude. After the record run, Loeb said, "I felt really good in the car, and I pushed it hard from the start to the finish," Loeb said. "I made no mistakes, and I felt the race was really good. To drive a car like this and race up here (to the top) is what makes this special. It's amazing." The French driver averaged an incredible 87 miles per hour while setting the record. Millen who had the record last year drove a Hyundai PM580T and was a distant second with a time of 9:02.192. Jean-Philippe Dayraut of France was third and also topped the previous record with a time of 9:42.740 while driving a 2011 Mini Countryman. We were wondering how long it would take to eclipse the 9 minute mark and it didn’t take long after the course was paved last year. Before last year, it took 95 years for a driver to break the once allusive 10 minute barrier. Now the records are falling at incredible rates. Sebastien Loeb driving the Peugeot 208 T16 has blown away the previous record and now the 8 minute barrier is next. 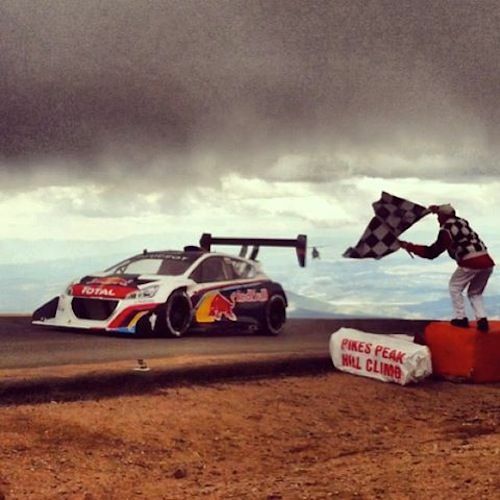 Watch Loebs NEW Pikes Peak Record 8'13"878 video.